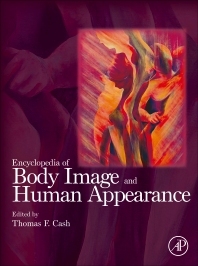 This scholarly work is the most comprehensive existing resource on human physical appearance—how people’s outer physical characteristics and their inner perceptions and attitudes about their own appearance (body image) affect their lives. The encyclopedia’s 117 full-length chapters are composed and edited by the world’s experts from a range of disciplines—social, behavioral, and biomedical sciences. The extensive topical coverage in this valuable reference work includes: (1) Important theories, perspectives, and concepts for understanding body image and appearance; (2) Scientific measurement of body image and physical attributes (anthropometry); (3) The development and determinants of human appearance and body image over the lifespan: (4) How culture and society influences the meanings of human appearance; (5) The psychosocial effects of appearance-altering disease, damage, and visible differences; (6) Appearance self-change and self-management; (7) The prevention and treatment of body image problems, including psychosocial and medical interventions. Chapters are written in a manner that is accessible and informative to a wide audience, including the educated public, college and graduate students, and scientists and clinical practitioners. Each well-organized chapter provides a glossary of definitions of any technical terms and a Further Reading section of recommended sources for continued learning about the topic. Available online via ScienceDirect or in a limited-release print version. Does the Public Support Laws to Prohibit Appearance Discrimination? Why Should Personality Predict Body Image? Who Benefits Most: Clinical or Nonclinical Populations? What are Appearance- and Performance-Enhancing Drugs? How Does Exercise Improve Body Image? Can a Single Bout of Exercise Enhance Body Image? Why Are Physical Self-Perceptions Important? Instruments Used to Measure Physical Self-Confidence and Competence: What Does the Evidence Say? Concluding Remarks and Future Directions: What Is Next for Physical Self-Perception Measurement? Judging a Book by Its Cover: Stereotypes or Realities? Is Beauty but Skin Deep? When Is Physical Attractiveness Most Important in Romantic Relationships? Are Digitally Delivered Psychoeducational Interventions for Body Image Improvement Effective? Are Digitally Delivered Interventions Based on Emotional Processing Theory for Body Image Improvement Effective? What Important Questions Remain Unanswered?